1 December 2014, at 10:43p.m. US - The numbers of pig farm samples that are confirmed positive for the PED and PDCoV in the last week were 83 and six, respectively. 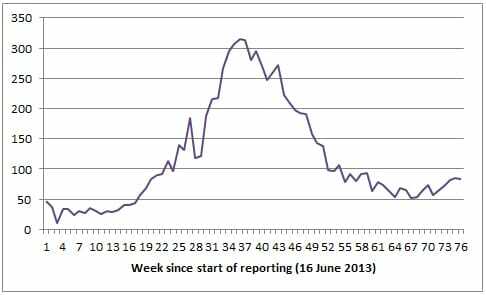 There has been a change in the reporting of results from the testing of farms in the US positive for porcine epidemic diarrhoea (PED) virus and porcine delta coronavirus (PDCoV), in an abbreviated report and with cumulative results now provided from 5 June 2014. The most recent results available from the American Association of Swine Veterinarians (AASV) are for the week 15 to 22 November 2014 and are shown in the following tables. According to that report, the USDA’s National Animal Health Laboratory Network (NAHLN) reports 83 positive accessions out of 627 tested for the week ending 22 November 2014. There are currently 32 states with at least one confirmed positive case of PEDV.